by Alvin Gary Starkman, M.A., J.D. 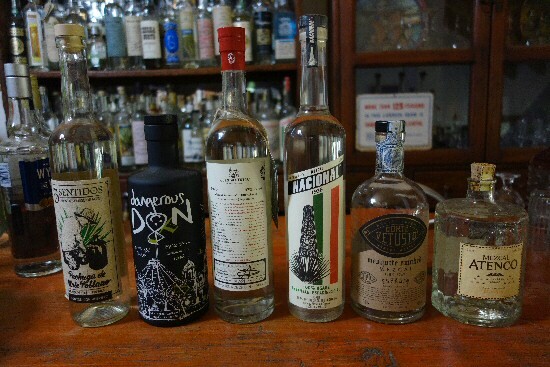 Over the past dozen years I have played a part in the development of a number of brands of mezcal distilled in Oaxaca; for the domestic Mexican market, but mainly for export to the US, South Africa, Germany, the UK and Italy, with projects currently underway for additional US trademarks as well as for Canada and Australia. Some are a source of pride, while others of discomfiture, the latter not necessarily based on quality of product since some are pretty good. However I suggest that since traditionally made mezcal (both ancestral and artisanal) inevitably varies from batch to batch, simple tasting notes in any event are not always very helpful in assisting consumers on a buying quest. And conversely, the brands which have provided me with the greatest gratification do not always produce mezcal to my personal liking. It is for additional reasons that these particular mezcals and agave distillates are worth of being honored. They include Nacional, Atenco, Corte Vetusto, 5 Sentidos, Dangerous Don and Cuentacuentos. There are others, but not all clients keep me updated after the principal job I have been retained to do has been completed. providing ongoing assistance and advice regarding matters such as exclusivity (including contractual matters and more generally liaising with lawyers and other professionals), flavor profile and ABV, as well as marketing strategy including pricepoint. Regarding the final point above, how much can that brand owner be paying his palenquero if his mezcal in an American marketplace costs $30 USD a bottle? Consider the costs associated with transportation, warehousing, taxation, agency representation, together with the profit the retailer must earn. Yet the entrepreneur is still making a sufficient enough profit so as to enable him to live a middle class lifestyle. Yes, everyone is entitled. But no, we don't have to support it. That's more than enough of the negative. And yes we live in a capitalist society. But in the agave spirits industry the concept of fair trade, if it exists at all, is in its infancy. However there are brand owners who indeed practice it without fanfare. Each has other significantly positive attributes, including the actual agave spirit's character, with differing broad taste profile, nose, and finish. The product is one thing, but the comprehensive corporate philosophy is another, for me perhaps more important than price and the contents of the bottle. To my knowledge none of the brands enumerated falls prey to the six negatives noted above. Each is worthy of becoming even more efficacious than is currently the case. Finally, it's the yearning of many to revisit Oaxaca. In turn, those who make a return pilgrimage will inspire others. Whether or not any of those six brand owners realize it, what they are doing for the industry and Oaxaca is significant, far beyond and much more important than any degree of financial success which comes their way. True, the brands owned by financially triumphant industry scallywags inevitably at least to a limited extent aid Oaxacan communities and the broader economy. That's the positive. I still have a scintilla of faith in humanity, at least to the extent that eventually the chickens come home to roost, and thus in due course the good in the business will thrive, and those not deserving will falter. If only the world really worked like that. I'm embarrassed to have aided some brands which I shall not name, the owners of which now enjoy significant success in small part through my tutelage; and I am similarly embarrassed that other mezcal brands have floundered; I can lead their owners to water, but can do no more. Thankfully this club of six appears on its way to continued accomplishment, both in terms of maintaining viable businesses, aiding the industry and Oaxaca through spreading the good word about mezcal, and enticing those who appreciate quality spirits. Mr. Starkman owns Mezcal Educational Excursions of Oaxaca (www.mezcaleducationaltours.com).